Guys! Guys! Guys! So I’ve not posted savoury food for a while, not because I haven’t been eating (obviously) but because I hadn’t cooked anything that I thought was inspired enough to wax lyrical about. But by the exclamation mark count at a massive three already – here is me waxing lyrical. Yesterday after what would rank up there as the most Relaxing Sunday Ever where myself and a significant person went for an all day wander through a park which culminated in an impromptu coffee with a friend, said significant person and I decided to make some homemade pizza for dinner. 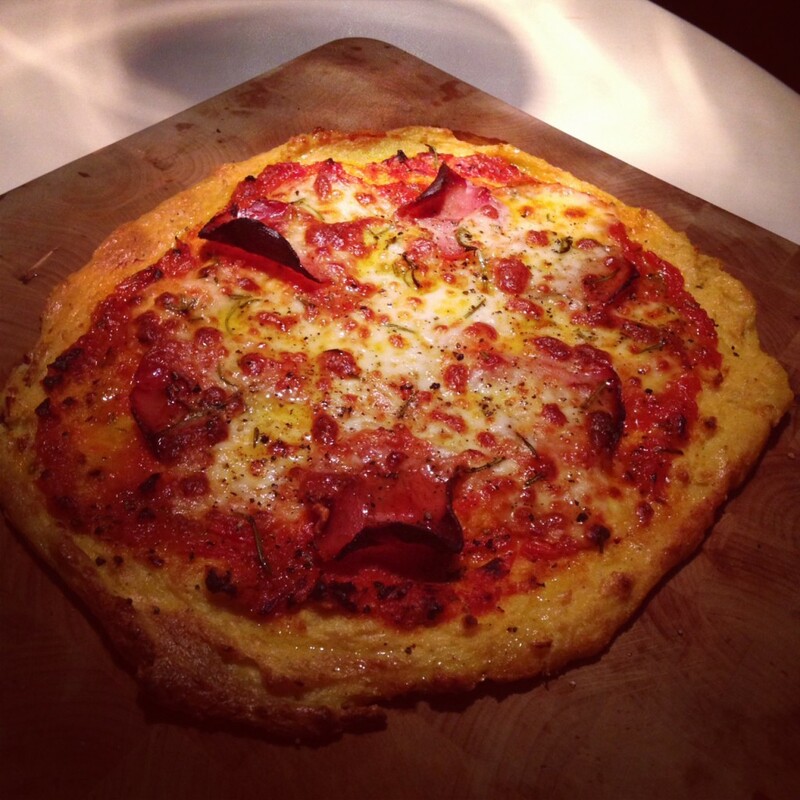 Only what with me not eating gluten we decided to make a polenta pizza and it was so flipping good! Honestly, you don’t even have to be gluten intolerant to enjoy this. Other massive bonus. It can be relatively easy to knock up as you don’t have to wait for the dough to prove. Essentially you’re cooking up some polenta in the traditional manner, but making it as thick as possible so it sets quicker and has a bit more structure post bake. Toppings wise we just went classic with a bit of tomato sauce (but made with plum vine tomatoes), mozzarella, and some slices of cured Spanish ham. Oil a non stock pan big enough for your pizza. In a saucepan at medium heat, bring your stock to a boil and while whisking furiously in one direction only (to avoid clumps) add your polenta in a fine stream. Keep stirring at all times to avoid your polenta from sticking to the pan and get this mixture nice and thick and reduced. You want to get it so thick that when you whisk it barely settles back in the pan. At this stage, probably 15-20 minutes down the line (read: strong arms), you want to add the grated parmesan. Quickly pour your polenta on the previously prepped pan and use the bake of a metal spoon spread out a pizza base shape, complete with slightly raised crust along the edge. Work fast, this will set quickly. Set this aside to cool. While this is cooling get that oven to 220°C. Make your tomato sauce and prep your toppings. Once your oven is to temperature and your polenta is sufficiently set (cool to the touch and has a nice bounce to it), quickly dress the pizza. Save the olive oil, salt and pepper for when it’s fresh out of the oven. Whack your pizza in and bake it until it’s nice and browned on the crust and the cheese is bubbling. Ours took approximately 20 minutes. Carefully use a spatula to loosen the pizza from the pan, you should know that the bake is good because it will be crispy on the bottom. Sprinkle on some salt and pepper and drizzle that olive oil. Eat immediately. I cannot express the sheer amount of pleasure this dish produced, if you’re talking about a great dish of soul food, this is certainly up there and resulted in me doing a happy food dance before I chowed down.